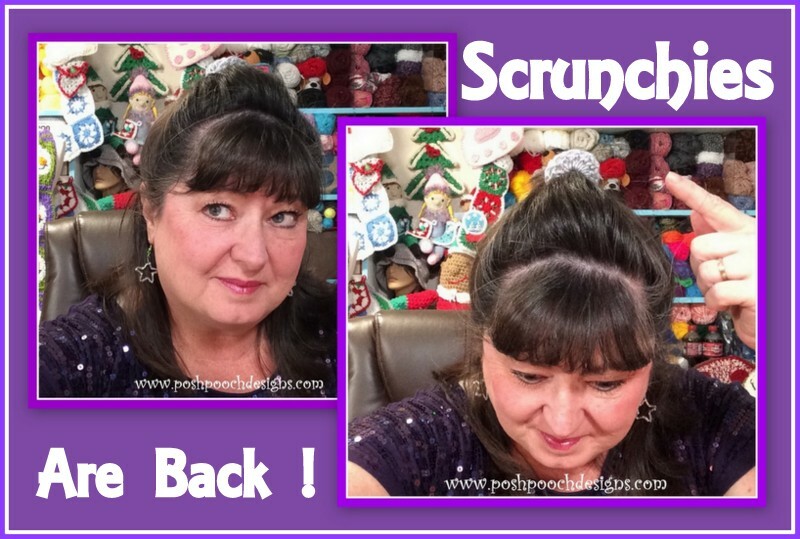 Scrunchies are back in Style. A Scrunchie is a elastic hair band covered in fabric. ankle as a fashion statement. choice of yarn, slide the beads on before you begin. Join yarn to the band, ch 3. 29 dc around the band, join to top co ch 3. For Style 1 - tie off weave in your ends. Repeat From * To * around, join to 1st sc. Here in Colorado, January through march, are our Snowiest months of year. 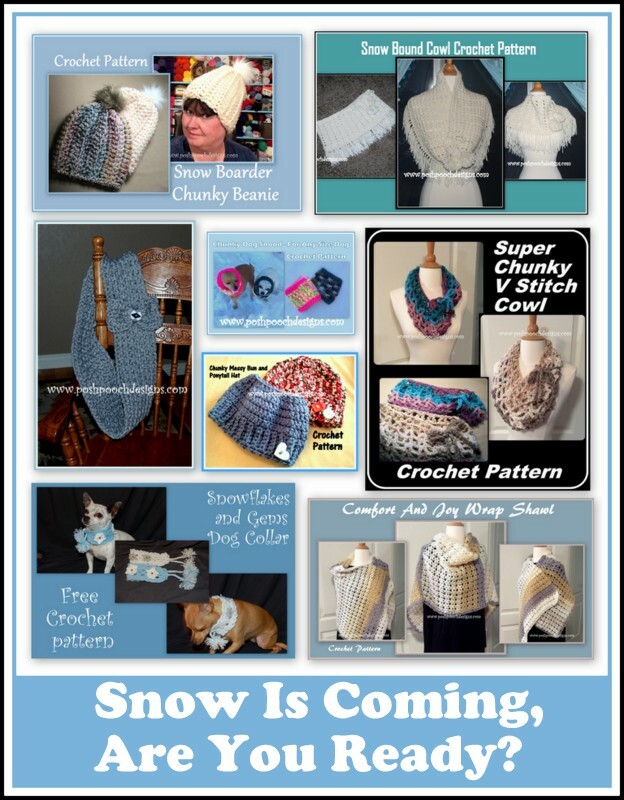 I have put together some warm and easy Crochet Patterns to help you get ready. 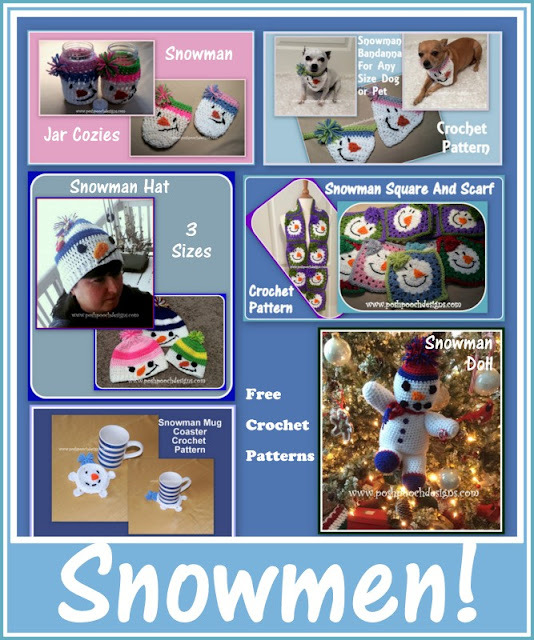 All These Crochet Patterns are designed by me, and are Free Crochet Patterns. where the Crochet Pattern is located. Think Snow! I Love Snow! something for everyone, Who loves Snow. 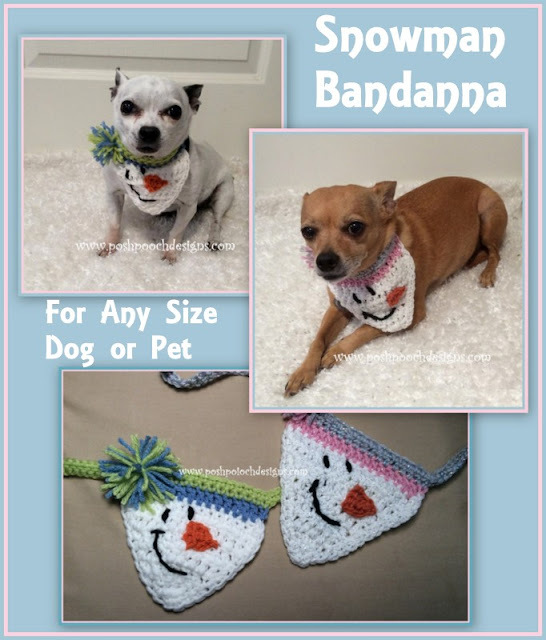 It is the link to the blog where the pattern is located. I received several messages, emails and comments from People who crocheted a gift for someone, and it wasn't received well. The Crocheter/ Giver was so hurt and discouraged. we will make for each person. the time and energy it takes to make something. Hospitals, Adult and Children's Cancer Charities. Rescue Centers and Homeless Rescues. Many, Many Causes and Charities. 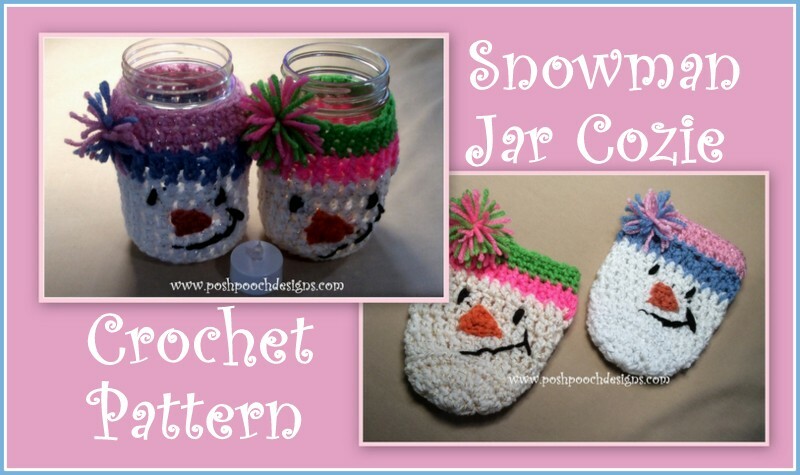 Super Cute, Super Easy and Lots of fun to Make. you are sure to enjoy this happy Snowman. Make them all the same, or mix and match them. 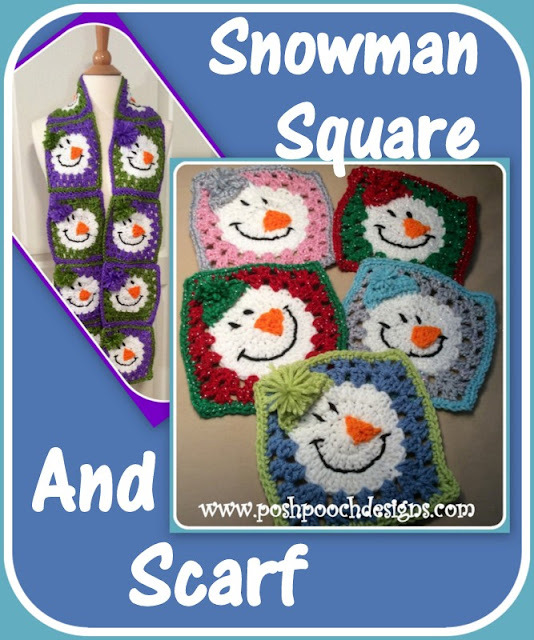 It's a Great way to use up some of your scrap yarns. Rounds are joined to the ch3 with a slst. When changing colors, ch 3 / ch1 after the color change. R: 3 - Dc in the same st as ch3, 2 dc in each dc around, join. Slst to the next ch1 sp. R: 7 - Decide which side you want to be the top of the Square. R: 10 – 1 sc in each sc, tie off leaving a 12 inch tail of yarn. Fold the hat up towards the corner. Use the tail of yarn to sew the hat in place. Cut a 10- 12 inch piece of yarn. Wrap the yarn around your four fingers 10 -12 times. Lay the loops across the string and tie the string securely. Trim loops evenly to form the pom pom. Attach to top of the snowman's hat. tie off leaving a 10 - 12 inch tail of yarn for sewing nose on face. Your squares may need some blocking, mine did. You will need 10 Squares For a 70 inch scarf. Place the Squares together, back side facing out. *slst, ch1, sk1* Repeat From * to * Across, tie off weave in your ends. Sew 5 squares together, then the next 5..
sew the 2 5 square sections together so they are facing forward. 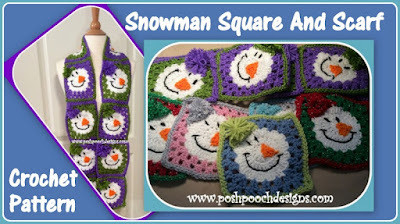 Or Your snowmen will be facing upside down on one side. And No wrestling them to the ground to get a sweater on them! You tie the ties were needed, and slip it on and off. No Buttons, buckles, or Velcro to mess with. It's so comfortable they won't even mind wearing them. To make the Bandanna larger Continue to repeat R: 5 to desired size. sc evenly up the other side of the bandanna. Slst across the 2nd tie, tie off. the black yarn through the White yarn. the hole and tie the loops tightly. 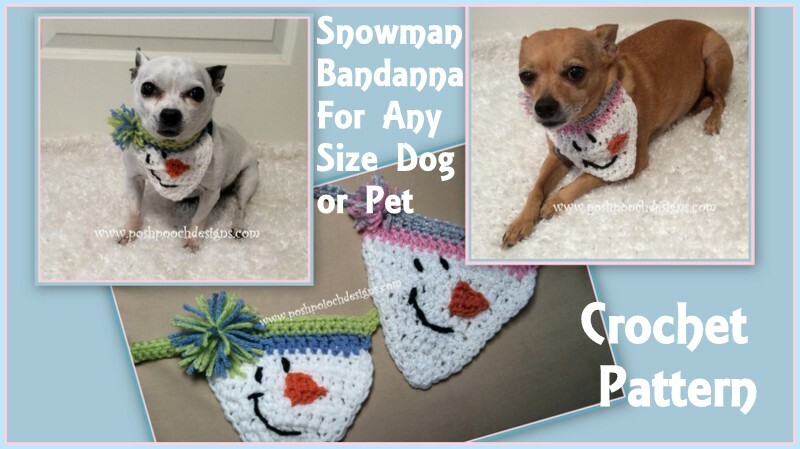 Tie the ties, and slip it on your pet for a fun and sweet Snowman look.